But only if there is enough demand. Porsche surprised us all when it announced the next-generation Macan will only be sold as an all-electric model, while the gasoline-powered current model will initially be sold alongside it. It may not necessarily be called the Macan, however. Speaking to WhichCar, company boss Oliver Blume revealed that the model’s final name hasn’t been decided yet. He also confirmed it will look "very different and future orientated” compared to the current model. This isn’t the only current Porsche model that could be transformed into an EV, as Blume also hinted an electric Boxster could be on the way as he believes the car’s mid-engine layout makes it suitable to get the EV treatment. A decision will be made later this year, but it all depends if there is enough demand to justify building an electric Boxster. If it gets the green light, the electric Boxster will ride on a dedicated EV platform rather than a modified version of the current architecture because the body of the combustion-powered model is not suitable for an electric car. This isn’t the first time Porsche has toyed with the idea of a fully electric Boxster. Back in 2011, Porsche introduced the Boxster E concept, a zero-emissions all-wheel-drive sports car with dual electric motors producing an output of 242 hp and 398 lb-ft of torque. 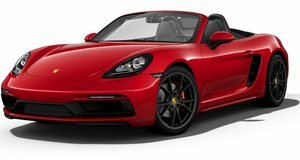 Weighing 408 pounds heavier than the conventionally powered convertible, the Boxster E needed 5.5 seconds to reach 62 mph from a standstill before topping out at an electronically-limited top speed of 124 mph. Porsche also developed two rear-wheel-drive prototypes without the front-mounted electric motor, which of course meant they had half the power of the dual-motor Boxster E. Consequently, the 0-62 mph sprint took 9.8 seconds while top speed was limited to 93 mph. Thankfully, EV technology has evolved significantly since then. Porsche’s first EV, the Taycan, will be unveiled later this year with far more impressive specifications, boasting over 600 hp, a 0-62 mph time of 3.5 seconds, and a range of over 310 miles.